Our Jans Park Avenue and White Pine Touring locations have award-winning full-service bike shops that are open year-round. Our Expert mechanics can fix a blown suspension, ghost shifting, and anything in between. Brake & shifting adjustment, safety inspection. Bike cleaning, wheel truing, hub & bearing adjustment, brake & shifting adjustment, safety inspection. Drivetrain removal w/ deep clean, bike cleaning, wheel truing, hub & bearing adjustment, brake & shifting adjustment, safety inspection. Fork service, brakes bleed, drivetrain removal w/ deep clean, bike cleaning, wheel truing, hub & bearing adjustment, brake & shifting adjustment, safety inspection. Both of our bike shops employ mechanics with the highest level of training. Many have attended Sram Technical University, Bill Woodul Race Mechanics Clinic, Specialized Bicycle Components University, and Shimano T.E.C. – just to name a few. 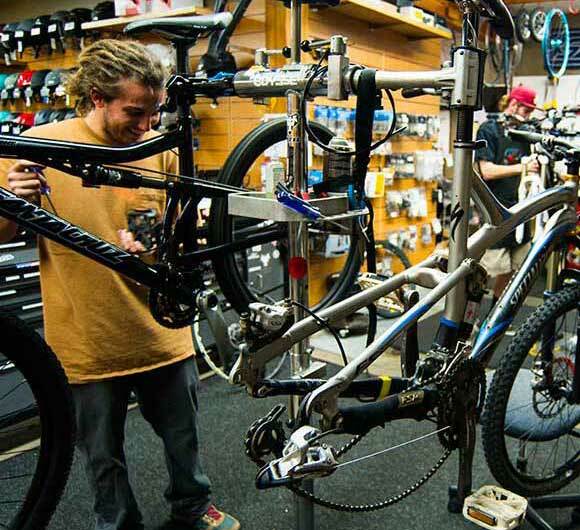 The Jans Bike Shop has been winning awards for 20 years, and White Pine Touring has been named the best bike shop in Northern Utah, and has made The Active Times’ America’s Top 50 Bike Shops list multiple times. Our shops have an extensive stock of over 10,000 parts, and access to thousands more from our distributors, which means there’s almost no repair we can’t make within a few days. We even stock custom parts for Specialized, Scott, and Santa Cruz bikes because we know you would rather be on the trails than waiting around for your bike to get fixed. All of our technicians are locals who are Expert road and mountain bikers themselves, and they can be found almost every day ripping the same singletrack or asphalt as you. They know that’s just where you want to be, and they’re committed to making sure you get there fast. Our Experts write extensively about bike repair and maintenance. Check out some of our featured blogs to learn more about bike tuning.